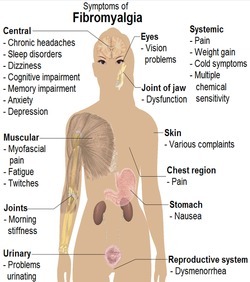 Fibromyalgia symptoms are often quite troublesome for the individual that suffers from them. Fibromyalgia syndrome or FMS is considered to be a rheumatic condition in the medical community. It is also considered to be one of the many medical mysteries that doctors and scientists have attempted to gain an understanding of over the years. It has been established that this condition is commonly misdiagnosed. It is also a medical condition that is often misunderstood. Fibromyalgia is characterized by fatigue, pain in the muscles that is considered to be widespread, and pain in the joints that is considered to be widespread. In this guide, you will learn about the most common fibromyalgia symptoms that are experienced by patients. Pain is considered to be the most commonly experienced symptom associated with fibromyalgia. It has been established that approximately 97% of all the patients that are diagnosed with this condition experience pain in the body that is considered to be widespread. The pain that is experienced is not centralized to just one location. As a matter of fact, it is most often experienced in several different regions of the body all at once. The pain that is experienced could resemble that of pins and needles being stuck all over the skin, it could be dull; it could be sharp and intense pain, and/or deep, aching pain. The pain is often felt in the soft tissues of the body, but it may also be experienced in the tendons as well as the joints. When it comes to fibromyalgia symptoms, cognitive impairments are commonly experienced. Many medical professionals refer to these symptoms as “Fibro Fog”. This “fog” includes many different types of symptoms that patients experience. Many patients may find that it is difficult to learn new information, retain information, and recall information that was previously learned. Many patients will suffer from complications that directly involve the use of language and others will have problems focusing their attention or concentrating in general. In addition to these common symptoms, it is also common for the patient to experience depression, mood swings, and general personality changes. Believe it or not, the patient that suffers from FMS will suffer from symptoms that are physical on top of the pain and cognitive impairments that are experienced. There are many different physical complaints that doctors are approached with. These include, but are not at all limited to, stiffness in the mornings or after resting or sitting for extended periods of time, moderate to severe headaches, complications in the range of motion, swelling, experiencing pain and sensitivity in the tender points of the body, urinary complications, irritable bowels, uncomfortable cramps associated with the menstrual cycle, and even physical exhaustion. Sleep disturbances that include not getting enough rest, problems falling asleep, and issues staying asleep are also considered to be common fibromyalgia symptoms. Fibromyalgia is considered to be one of the most intriguing when it comes to medical mysteries of the world. There is no one cause that has been identified with this issue, but there are several theories surrounding the perplexity of this rheumatic condition. Medical professionals that treat patients that have fibromyalgia symptoms are unable to cure the condition. However, they are able to assist the patient in soothing the symptoms associated with FMS. Treatments typically include physical therapy, occupational therapy, and prescription drug treatment. If you suffer from fibromyalgia symptoms, it is important to ensure that you consult with a medical doctor so that a treatment plan may be established.